It’s here, 2017, and #MetaBeers returns. We’re taking another trip this month, to a different location, the rather fetching Mulberry Bush, which claims to be the best pub on the Southbank. Come and see what you think, before we settle back at the our regular spot for the coming months. This follows on a November Anniversary special, at the familiar Crown Tavern on Clerkenwell Green, where we talked about what makes a good series, ate the usual delicious food, and enjoyed the only metadata pub quiz with floral prizes. Plus that landfall of bubbly and cupcakes. The next date for your diary (as advertised in our newsletter) is Wednesday 18 January from 6:30pm for a 7pm start. We’ll be talking about movies, their past present and future. #MetaBeers are our monthly get together with colleagues, friends, partners, and likeminded folks. They are spoken in plain English, and are a fun night out where we all expand our views as we consume the best ales and finger foods an English pub has to offer. As we restart MetaBeers for 2017, we will finally talk about movies themselves! Did you watch any over Christmas, are you looking forward to Oscar season? What role does video content over 90 mins still have? How can we help people discover the best movies? 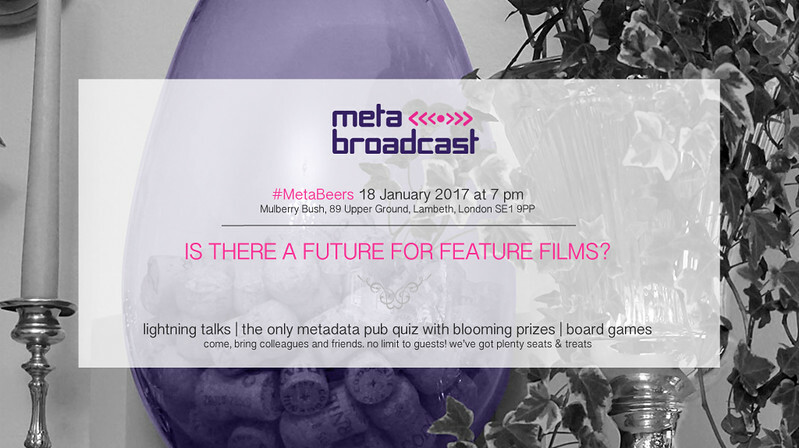 You sign up to #MetaBeers, let us know you’re joining, and come along with all the +1s you like. We prepare talks, buy pints & treats, then we all gather round and make merry. We’re having as many 5 minute talks as needed to cover the theme, but never more than 1 hour. If you’d like a spot (this month, in May 2017, etc.) on the running order, do get in touch*. back in november: what makes a perfect series? next time: what about february? Looking further into the future, in March we’ll check in on online-only content. Content that’s not broadcast is now very real indeed. We’ll look at what’s working well, what looks like early hubris, and where this is all heading next. That’s on the 15th, too. If you’re the organised type, get these in your diary! Dates for the rest of 2017 are: 12 April, 17 May, 14 June, 19 July, 16 August, 13 September, 18 October, and 15 November. But that’s still a way away. For now, please do join us on Wednesday, January 18th. * drop a comment here, pick up the phone, tweet at @metabroadcast, reply our invite (signed up yet? ), write us an email, come to the pub and register—lots of ways to get in touch with us! Updated: a few times 16-18 January, to update the schedule.